Moeketsi was born on 27 July 1925. As a young boy, he watched and listened to his older brothers playing jazz instruments, thus, influencing his musical taste later in life. Kippie's first musical instrument was the clarinet which he played with his first band known as the Band in Blue. Kippie and the Band in Blue played for sheebens and slum audiences. Although, these people he played for enjoyed the music to some extent, Kippie felt discouraged by the minimum interest shown by the audience. This, and other personal problems resulted in a life long habit of drinking and money squandering. However, these problems did not stand in his way of being a renowned saxophone player, an instrument he played after he left the Band in Blue. Kippie has made a great name for himself in the jazz industry by playing with other great South African jazz musicians such as Abdullah Ibrahim, Jonas Gwangwa, Hugh Masikela and Mirriam Makeba. He also toured with well known bands such as the Shantytown Sestet, the Harlem Swingsters, the Jazz Epistles and the Jazz Dazzlers. Moeketsi's life as a musician is captured by Peter Esterhuysen in a book tittled Kippie Moeketsi: Sad Man of Jazz. Esterhuysen captures Kippie's life of being a great player to being a sad man, that is, drowning his talent in drinking. Like many South African musicians, Kippie died like a pauper in 1983. 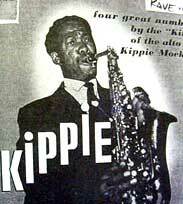 However, his name still lives on, through Kippies Jazz Club in Newtown, Johannesburg, which was named after him.